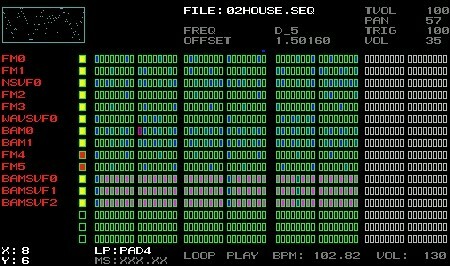 DSPmusic.org has just released the latest version of its homebrew PSP music sequencer PSPSeq 3.0. With PSPSeq you can create songs with up to 16 independent audio tracks, use WAV audio clips of your own and then modify them with a number of settings, or even use some of the built in synthesizers to generate sounds. There are strong looping and recording features as well. If you are into homebrew music apps on the PSP, then this will give you a strong offering of features. We had a chance to catch up with the author, [Ethan Bordeaux], and ask a few questions. You can check out the short interview after the break. Q: What inspired you to write a music sequencer for the PSP? A: My inspiration started with my main music project I was working on before PSPSeq – myself and some friends designed custom DSP hardware to create autonomous generative music (the project was called Chiclet). I created the synthesis engine running on the DSP. I learned a lot from the project but wanted to make a tool that could contain some of my synthesis and sequencing ideas but in a more user friendly package. Around the same time a friend of mine from the Chiclet project (Noah Vawter) was working on a PSP music sequencer called PSPKick. He kept telling me what a great platform the PSP was for homebrew, and for my 30th birthday a bunch of my friends chipped in and bought me one. I also considered using the GP2X however the PSP has a lot more horsepower and a larger installed base so I went with that. I like the GP2X quite a bit conceptually but wanted to pick the fastest system so I could make the best synthesizer and sequencer possible. Q: How many people are involved in the project? A: I’m the only developer for the project. I made everything from the synthesis engine to the GUI and the documentation. The one place that I have received help is with demo tunes. The PSPSeq community has been great for that. While I enjoy writing music I think I’m better at making things that make music rather than writing it myself, and really enjoy hearing the music created by users. Q: What features do you hope to have in future releases? A: For the moment I’m just enjoying having finished the latest release. I really feel like PSPSeq 3.00 is capable of making some great music and that the full potential has yet to be tapped. That said, the two big features I would like to add to PSPSeq are configurable LFOs and some sort of mixer stage with additional FX. how good is this compared to psprhythm? jim – it’s a totally different beast. PSPRhythm is much more about sample playback while PSPSeq is much more about synthesis (while still capable of sample playback as well). if you’re into more experimental sounds and tweaking synth parameters PSPSeq is more likely for you. the interfaces are definitely a lot different and as with most audio programs it really comes down to learning them and seeing which one makes more intuitive sense to you. one thing i will definitely give PSPRhythm is it has a beautiful interface, but don’t let the older look of PSPSeq make you believe that it’s not capable of making great music. for some examples, be sure to check out the mp3s at the bottom of http://dspmusic.org/psp. there’s some pretty amazing songs written with this thing. what is it with the wierd “after the jump” or “after the short break” that all the blogs are using. It just sounds retarded to even have that random sentence stuck in for no real reason. It’s so long articles take up less space on the front page. any psp hacks? that DOESN’T require u taking ur psp to parts? Another great feature from the pspseq 3.00. I like the fact that it allows to write your very own music. Any glitches or bugs to this firmware ?